How does it relate to determining your voice and articulating that voice and allowing others to find it – to be recognizable. It also has me thinking about how other artists look at themselves – through the democratic machine – the camera…. More about idea and technique (or maybe craft?). What role does style play? 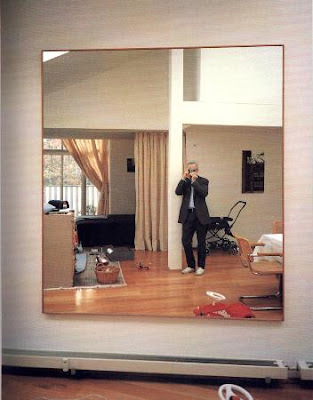 Suppose a painter appropriates photography – to loosely record an image of self – three times. Is it a photograph (or just a narcissistic snapshot) or a painting? What might it say ? Richter’s self-portrait is more than just a photograph – not really a snapshot – after all. It does more than merely record. What transforms it ? The image or the stuff of the image (oil paint) ? Is it pretty? What is it that makes the object interesting to me – What provokes me to think. 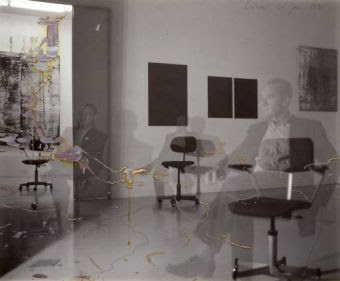 In Richter’s self-portrait above – I visually I go back and forth into the image (the realness represented by the photo – yet recorded three times over) and then back to the physicality of the surface and the actions of the artist recorded at yet another time of the artist’s intention – an application of tool and oils… a layered time record. 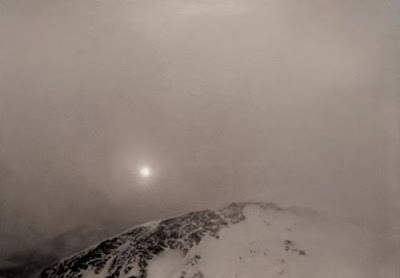 I think Richter represents both idea and craft in the image and I like it for that depth. But it’s all about the artist and his struggle to justify his painting right? But the craft is sort of only represented – not really embodied in the particular portrait example. 107 1/2 in. x 83 1/2 in. Here’s a link: Chuck Close Opening Day Talk at the opening of his Retrospective at the Walker Art Center. This melding of photography / painting is of more interest to me in particular than the question of projecting an image over a canvas to assist in producing an image – but an interesting post is presented here – on Alex Soth’s archived blog… provoking how one decides upon a content of the image – basics – I suppose on composition / content. Maybe I just don’t get it…About “style” and “categorization” by photographers and by lovers of photography – for me anyway – what seems to come of this is nothing more than galvanizing me on my opinion that it is good to avoid a recognizable style (at some point) but this probably puts at risk a weak reception of work. Just how important it is to be recognizable and therefore more saleable? Very important problem and a question – if you are trying to support yourself through your art. On one hand this is troubling. It parallels the problem of educational pedigree as a ticket to serious consideration. I wonder about questionable motivations. I guess I have a thing for amateur works. A sense of voice is important to develop – but determining when that voice is your own is excruciatingly difficult – and who gets to decide anyway? The buying public? How easy it is to fall into a mimicry – style and all. It takes a lot to figure out a direction – and to make it your own. Perhaps my own view is a warped and narrow view – but that’s where I am at the moment. I think finding a tone in your voice is key – but how to do that? I hope to move beyond questions of style – maybe it’s just a matter of accepting style as a given (by others) and working with it as kind of constraint. It is just a matter of doing the work. Maybe Richter has found a way to keep from getting caught up in style – by showing how irrelevant it is in his work – Something to think about. Maybe it’s a good exercise to try an make a self portrait ? This entry was posted in Art, Inspiration, Painting and tagged art, Chuck Close, Gehard Richter, Gerhard Richter, Painting, Photography, self portrait by Matt Niebuhr - West Branch Studio. Bookmark the permalink.